This IOTA is a full day’s drive north of Western Australia’s capital Perth. The islands in the group are not easy to access without a good boat and support. Dirk Hartog Island can be accessed by arrangement with the owners, see their website. The island is suitable for the experienced, well equipped camper. 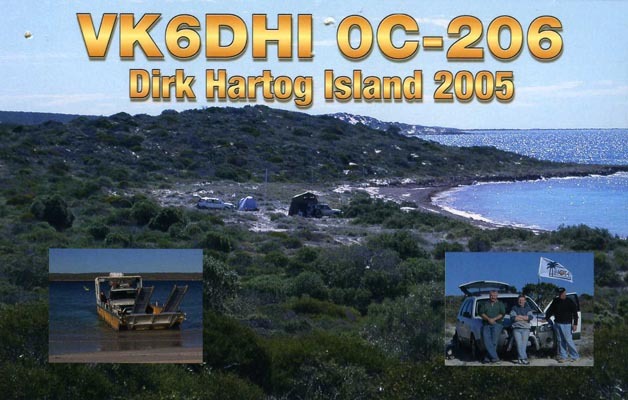 The group visited Dirk Hartog Island in 2005 with a modest 562 contacts being made due to mediocre propagation. The trip was the subject of a story in the Wireless Institute of Australia magazine "Amateur Radio". An IOTA activation is a good chance for the average amateur to hone up his skills as an operator, camper and general adventurer especially when the activation is a "wanted" one. Degrees of difficulty in getting to islands vary from the simple to the totally crazy. The islands off the Western Australian coast present the full range of challenges such as Rottnest which is simple, to the extreme like some of the groups off the Kimberly coast that have been activated over the last few years. Dirk Hartog probably lies somewhere in the middle. Dirk Hartog Island is the most westerly part of Australia, separated from the mainland by a narrow passage of water approximately one kilometre wide, it is about 70kms long and averages about 10kms wide. The first European to encounter it was in 1616 when the Dutch sailor Dirk Hartog landed at what is now known as Cape Inscription and left behind an inscribed pewter plate with details of the visit. First European occupation of the island was in 1869 when a pastoral lease was granted and a thriving wool industry was established which continued until the late 1960’s. At that time the Wardle family purchased the Island and the number of sheep was reduced until today pastoral activities have ceased and the Island is an eco-tourism destination run by the family. From July 2006 the island will be managed by CALM, a Western Australian government instrumentality, as a conservation area with the family retaining a small private holding. The island is wild, wind blown and an experience in itself to visit, there is no public access and no made roads only rough tracks. Current policy is that only eight visiting vehicles are allowed at any time, these must be 4WD and have good ground clearance. The only access is by a barge operated by the Wardle family and must be booked well in advance. 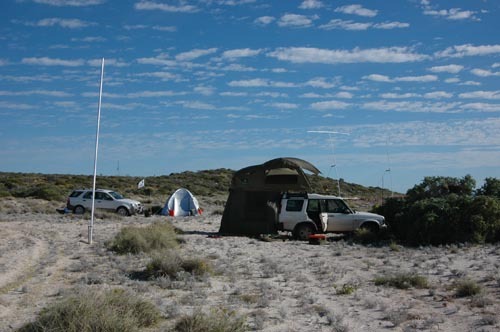 The island falls within the West Australian group for IOTA having the designation of OC 206. 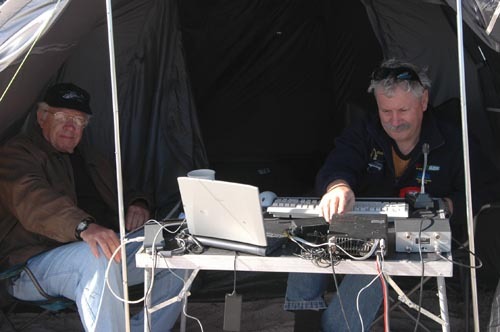 Wally VK6YS, after other successful island activations that included Browse OC-234, Pasco OC-071, Viney OC-266 off the Kimberly coast and Breaksea OC-243 off Albany in the south, decided that Dirk Hartog was the next good candidate for activation as its standings in the IOTA "most wanted" list were high. Dan VK8AN a veteran of the previous expeditions and Nigel VK6KHD, who had participated in the Breaksea activation, agreed to come along. Jane, Nigel’s XYL also agreed on the condition she was allowed to fish and not be bothered by the radio stuff! Our plan was to spend a long weekend on the Island hopefully to work as many contacts as possible coinciding with the weekend openings into North America and Europe. Dan flew down from Darwin to Perth on the Thursday before the weekend and we set off early on the Friday morning in two vehicles loaded with supplies and radios. A nine hour drive from Perth saw us at Steep Point late on the Friday evening in anticipation of crossing the following morning to the Island. The drive to Steep Point is not for the faint hearted as it is 750kms from Perth with the last 100kms dirt road, 30 kms of which is 4WD only and very corrugated in places. Early on Saturday morning the barge picked us up and we made the crossing. The barge takes only one vehicle at a time loaded from the beach and after a crossing of about 15 minutes landing is made on the Island also on a beach. With both vehicles safely offloaded we set out for the homestead and eventually the designated camping grounds. We settled on setting up camp at Louisa Bay about halfway up the Island. The choice was dictated by being able to get close to the sea and it being relatively sheltered although when the wind blew from the east it was a different story! The camp consisted of two operating stations. One station operated on the lower bands using an Icom IC706 Mk2 and Force 12 Sigma XK40 antennae. 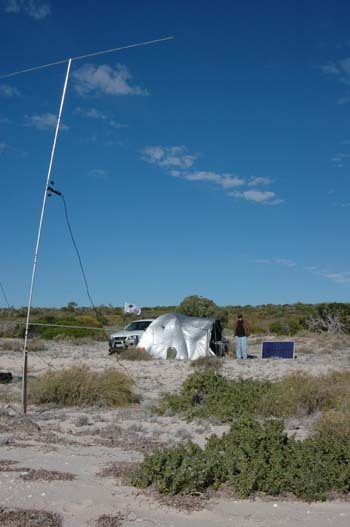 This antenna is a ground independent centre fed vertical dipole used successfully on previous expeditions; it has the advantage that two can be set up to provide gain and directivity although this configuration was not used on Dirk Hartog. The second station was a Yaesu FT817 and Palomar amplifier into a half wave sloping dipole set against a 6m aluminium mast and tuned to 15m. After working several of these types of operations we are firmly of the belief that lots of power and gain antennae are not warranted. When the bands are open and with modern alert systems via the DX cluster, etc being the wanted station is no barrier to communication providing good operating practice is observed. Power for the radios came from batteries, backed up by a Honda EU20 generator. The Honda generators are very reliable and economic to run as the 240v is generated by a solid state inverter and engine revs are automatically governed to suit load. Fuel economy was an important consideration as we had to carry all fuel and water requirements onto the Island, making for heavily loaded vehicles. However, despite the solid state design, making the EU20 RF quiet is a challenge especially under the low background noise conditions experienced in locations such as Dirk Hartog. Home brew line filters using wire wound toroids were employed and this removed a lot of the noise but the best filtering appeared to be simple 150mm loops of at least 6 turns of the extension cable at strategic points along the power feeds. A 64 watt solar panel was also used to keep batteries topped up. Laptop computers for logging and automatic Morse code generation were employed. The laptops were powered from inverters and the radios from switched mode power supplies or direct from battery, none of these devices gave any interference. We operated two stations as band conditions permitted. Although the two stations were separated by only a few meters cross band interference was eliminated by the use of band pass filters. The I.C.E. filters were imported from the USA and have a 0.25db injection loss for an out of band rejection of 35db. They were highly successful as one station could work away on 15 metres and the other on 40, 30 and 20metres as if the other did not exist. First contacts were made on the Saturday afternoon with openings into Europe and Asia on 20 and 15 metres. A scattering of VE stations also appeared but by the early evening the bands closed. Early Sunday morning 40 metres CW was operated with mixed results and a move to 20 metres sideband was more successful. The greatest disappointment of the weekend was working 40 metres; time and time again we would be wiped out by contest stations in Europe simply treading over the top of our signal. Some might say that more power was needed but this probably would not have made much difference, it was the total absorption of the other operator in trying to achieve his objective and no regard for other operators trying to work the rare IOTA that was the problem. Sunday saw ongoing QSO’s throughout the day as conditions permitted, openings being patchy on 15 metres with 20 the most reliable. The evening opening into Europe on 15 and 20 metres was good while it lasted and it was especially nice to hear operators remark "Thanks for the new one"; it makes it all worthwhile. 15 metres was prematurely closed as broad band "woodpecker" interference started up and we could not copy anything under its 9+ signal. The noise continued until the bands closed. Propagation on Monday morning was again poor and the day was spent mostly relaxing, taking photographs and then packing up camp to move back to the landing point for the transfer back to the mainland the next day. A total of 562 QSO’s were made over the two day operating period. A modest total perhaps when compared to other IOTA activations that we had participated in but none the less satisfying and the thrill of working a dog pile when it happens is something every amateur operator should experience.